BUNCRANA Pier has re-opened for business three months after the drowning tragedy that claimed the lives of five members of the same family. The Lough Swilly car ferry from Buncrana to Rathmullan has resumed its summer sailing schedule as tourists and local people slowly return to the seaside amenity. Donegal County Council today confirmed that the pier’s slipway was cleaned last week to remove algae ahead of the resumption of ferry sailings on Friday, June 17. A combination of sodium hypochlorite and pressure washing was used to remove the slippery green growth. The local authority said algae build-up will be monitored while the ferry is in operation over the next three months. 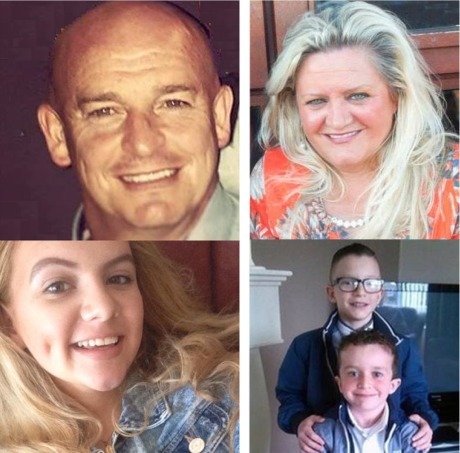 The pier fell eerily quiet in the weeks following the tragic deaths on March 20 of Derry man Sean McGrotty, 49, his sons Mark, 12, and Evan, 8, his mother-in-law Ruth Daniels, 57, and Ms Daniels' daughter Jodie Lee Daniels,14. It is understood the accident happened after Mr McGrotty's Audi 4x4 got into difficulty on the slipway and slid into the tidal water after a daytrip to the seaside. His baby daughter Rionaghac-Ann was the sole survivor of the accident after she was rescued by Fanad footballer Davitt Walsh, 29, who bravely swam out to the sinking vehicle. The infant’s mother Louise James, 35, who lost her partner, two sons, mother and sister in the tragedy, recently thanked those involved in the search and rescue operation. She said she was grateful for the huge outpouring of sympathy as news of her enormous loss spread across the world. Pier tragedy: Clockwise, Sean McGrotty, Ruth Daniels, Mark and Evan McGrotty, and Jodie Lee Daniels. Donegal County Council also confirmed that a preliminary review of safety at the pier has been carried out with the final review due to be completed later this year. The local authority said that the safety gate at the slipway will be locked by the ferry operator, Arranmore Ferries, each night during the summer season. "The ferry operator has signs in place to help control traffic wishing to board the ferry and traffic is directed down the slipway and onto the ferry by the ferry crew," said a council spokesperson. "The gate at Buncrana (slipway) remains open while the ferry operates between 10am and 8pm and is then closed and locked by the ferry operator at night," the spokesperson added. Meanwhile, hundreds of people are expected on the pier at midday this Saturday for the official naming and dedication of the new 2.4 million euro Lough Swilly RNLI lifeboat 'Derek Bullivant'.